South Korean rapper Psy's eccentric song sensation "Gangnam Style" has spurned a new parody by Inri Christ, a bizarre Brazilian religious man who claims to be the reincarnation of Jesus Christ on Earth. "In response to requests, the disciples of INRI CHRIST interpret 'INRI is our Father,' the mystical version of Gangnam Style – Psy, now with 'dance of Inrizetes (disciples of Inri)'," says the description of the video on YouTube. 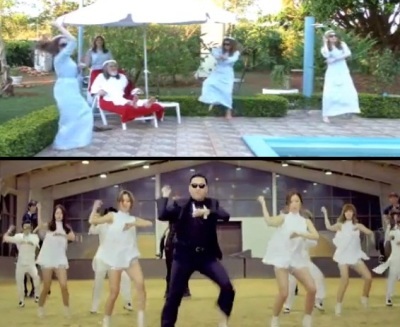 "Gangnam Style" is viral music video originally intended to be a satire of a small neighborhood in Seoul, South Korea, renowned for its wealth. The video with Psy playing a "clownish caricature of a Gangnam man" has recently entered the top 10 most viewed videos on YouTube with more than 430 million views since its July 15 release. Seeking to attract public attention, Inri has used the sensation to make a parody. The comic religious leader has similarly made other parodies of other artists such as Katy Perry, Rihanna, Justin Bieber, among others. Inri, who lives in Brasilia, the capital of Brazil, has his own church, the "Soust," which claims to be the formalization of the Kingdom of God on Earth, according to its website. Christian apologist Johnny Bernardo has previously said to The Christian Post he describes Inri Christ as a "character" who has not only religious purposes but also business purposes, trying to find ways to attract the public. Inri has been appearing in public with his Inrizetes in several popular and humorous TV programs in Brazil, such as Fritada, Panico na TV, CQC, among others.